We recently launched some new fuel fitting parts so you can make 5/16in fuel lines for Stromberg 97s. While the stock early Ford 1/4in OD hard lines are great-looking for a typical flathead motor, many people like the thicker lines for Chevys and other applications. This includes us, of course, as our recently launched 9146-BIG 3-into-1 fuel line uses 5/16in OD stainless hard line. And more than that, all our forthcoming new Stromberg BIG 97s are 5/16in hard line compatible. You can see in these pictures how the BIG S-jet seats the 5/16in line and what happens when you try it in the regular S-jet – it leaves no seat for the ferrule. Click to enlarge. Hello, I have three new 97’s that I purchased in 2011 and am finally getting around to fitting up. I will be bending my own 5/16 OD hard line and was wondering what size fitting will screw into the carb? I purchased three 9180K’s and started hand screwing them but stopped quickly as it went tight. Hi Shane, A couple of issues here. Firstly, 9180K is our 1/4NPT hard line adapter so the tapered NPT thread won’t fit into the S-jet, which is 1/2in UNF – that’s why it went tight. And as you worked out, regular Stromberg 97 inlet valves (needle & seats) were designed with a 1/4in pocket to take the line and the angled seat is positioned so the brass ferrule can compress properly to seal on the 1/4 pipe. If you put 5/16in line in, it doesn’t sit in the hole properly and covers most of the angled ferrule sealing surface. The good news is, we recently developed a new S-jet inlet valve for our 97s specifically for 5/16th line, and we also just launched a pack of compatible ‘Ford Nut’ style compression fittings for them. You need 3 x 9564K-BIG (the S-jet inlet valve) and just one pack (3 nuts and 3 ferrules in a pack) of 9081K-BIG (the Ford Nut for 5/16th line). All the best, Stromberg Tech. We’ve been promising a summer packed with new products. 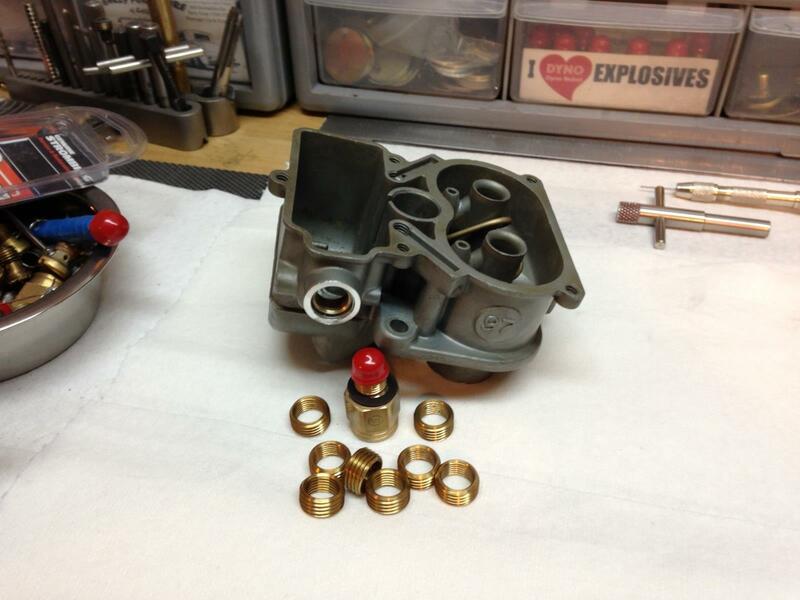 So let’s get it kicked off with our new, ready-to-fit, Chevy 3×2 fuel line for small block engines. Set at 5-1/2in carb spacing to fit Offenhauser and Edelbrock SBC 3×2 intakes, the new Big Bore fuel line (Part No. 9146-BIG) uses the classic 3-into-1 format with CNC-bent 5/16in OD 304 stainless steel lines and leak-free, ‘invisible’ furnace brazed joints. 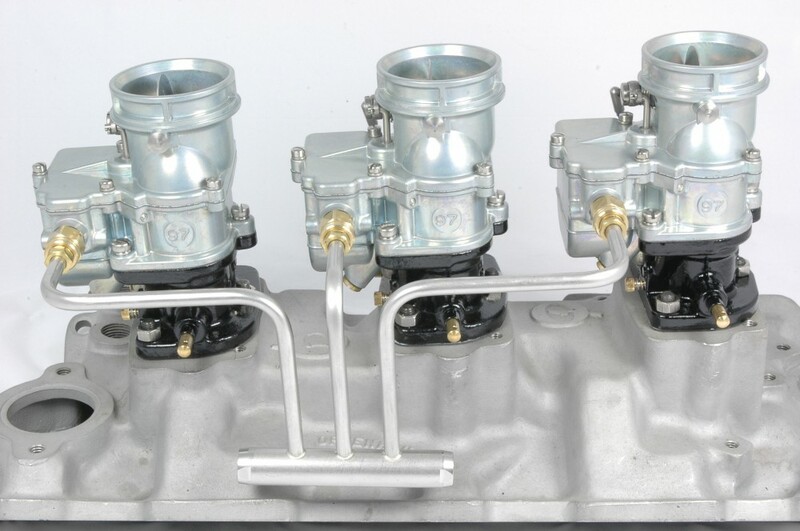 The round-bar fuel block sits down close to the manifold, matching the four degree Chevy intake angle to align visually with the valve covers. And for maximum versatility, it has 1/4NPT threads at both ends with machined 11/16in AF flats so that fittings can be tightened safely without damaging the line. The brass compression fittings (included) to attach the line into the three 97s retain the look and feel of the traditional ‘Ford Nut’ fitting. Traditionally, all Stromberg 97s use 1/4in line, but for a Chevy tri-power, the 5/16in line looks far more appropriate. The regular 97 fuel inlet won’t accept a 5/16in line, though, so we’ve developed a new Stromberg S-jet inlet valve (part number 9564K-BIG) with the correct 5/16in seat, which must be used with this Big Bore fuel line. The 9564K S-jet, (standard on regular Stromberg 97s) must not be used with 5/16in line. Our forthcoming high cfm BIG 97 carburetor will come with the BIG S-jet as standard. Prices are US$129.95 and £66.63 plus tax if you pay in sterling. To help hot rodders install their new Chevy 3×2 fuel line, we’ve also launched a complementary range of 1/4NPT brass fittings. You can read about these in our next Bulletin post. The new Big Bore fuel line and fittings are part of the Stromberg Linkage & Fuel Delivery range, available from a network of Genuine Stromberg dealers worldwide. As always, full instructions are included in the kit and further help is available via the Stromberg Tech Center at www.stromberg-97.com .